When I went to college, I was given a guide to student living. As I recall, it offered almost nothing about school, but it did have several recipes for vodka punch (Add vodka to Hawaiian Punch; serve.) which you were to mix and serve from your plugged bathroom sink. So not helpful. By comparison, Stuff Every College Student Should Know would be very helpful — and a good gift — for any student. There are four sections: Dorm Living and Personal Care, Academic Life, Social Life, along with Money and the Real World. Individual chapters tackle real life topics like, “How to Take Care of Yourself When You’re Sick,” “How to Take Notes,” “How to Deal with Stress and Homesickness,” and “How to Avoid Going Broke on Textbooks.” There’s even a section on how to deliver a commencement speech someday, since author, Blair Thornburgh, gave one at her graduation. One of my favorite tips, though, was a part on non-stupid conversation starters, in the section on “How to Find and Make Friends,” which suggested simply saying hello when you first walked up, so things won’t end up awkward later, in a game of “silence chicken.” Good advice. Like the rest of Stuff Every College Student Should Know . Find Momo reminded me a bit of “Where’s Waldo,” if Waldo was a border collie, and no one else was standing around him, and the scenes were photographed IRL by a world-class photographer. The photographer, Andrew Knapp, takes beautifully stark photos with a lovely sense of composition. He started leaving “Momo” in the shots when the dog refused to leave. When the photos were posted on Instagram — tagged, #findmomo — an internet star was born. Photography and dog lovers of all ages will adore this lovely book. Ready for your cat to become the Internet darling you know they are destined to become? 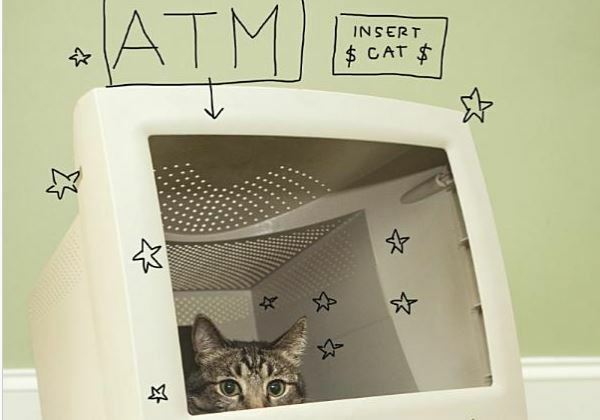 How to Make Your Cat an Internet Celebrity has the master plan for you. Yes it’s pretty tongue-in-cheek. But then, if you really do want to make your cat (or anything else online) super ultra mega popular, this is the ideal book for you and yours. It’s well-illustrated, and includes honest-to-Mittens good ideas, like static-y balloons, adjusting your approach to your cat’s temperment, Roombas, how to capture all that comedy gold on video, and Christmas trees. Sections include cutesy-yet-actually-helpful subjects like, “Who’s Your Tabby? Identifying Your Cat’s Type,” “The Ten-Armed Octopus of Media Dominance” and “Get your Do-nothing Cat to do Something: 27 Prompts for Cinematic Glory.” While How to Make Your Cat an Internet Celebrity is truly “A Guide to Financial Freedom,” it’s also entertaining reading and a perfect gift for cat-owning, web-savvy friends and family.